tomatoes Archives - Wots For Lunch? 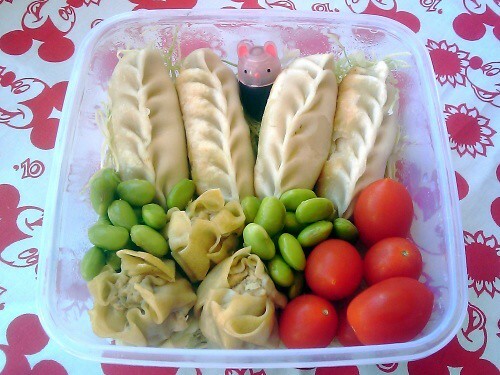 I had these dumplings hiding out in my freezer begging to be freed from their icy home. I finally gave in to their demanding little voices and heated them in a makeshift steamer* before popping them into my lunch box. a little bottle of soy sauce. This salad came together quite by accident with a few pantry staples and the lovely broad beans that have been frequenting my veggie box recently. A rather happy discovery on my part that I’m sure to repeat often this Summer. Who doesn’t love a plate of sausage and mash? It’s the quintessential pub meal full of calories and comfort. 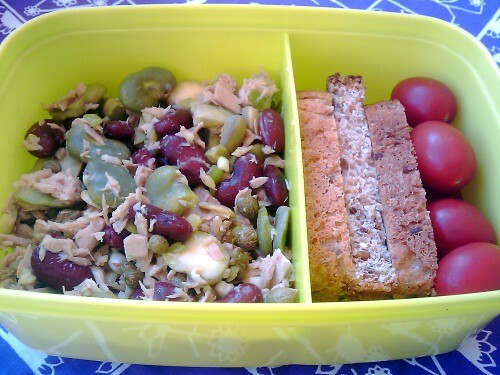 In my lunch box it may not look so pretty, but it sure does taste good. some plain yoghurt with a swirl of apple butter. Guess what’s for lunch today? Leftovers from this month’s daring cooks challenge. a salad with lettuce, onion, baby tomatoes and avocado. 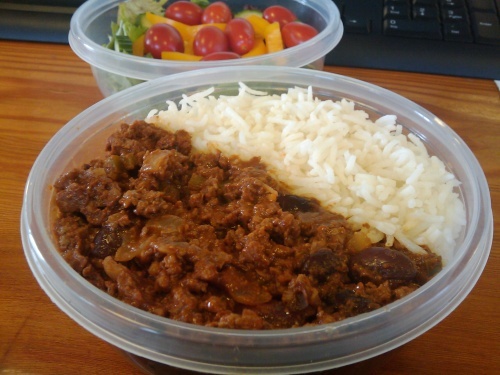 This chili con carne is one of my go to meals and there is always some hanging out in the freezer patiently waiting for it’s time to shine. 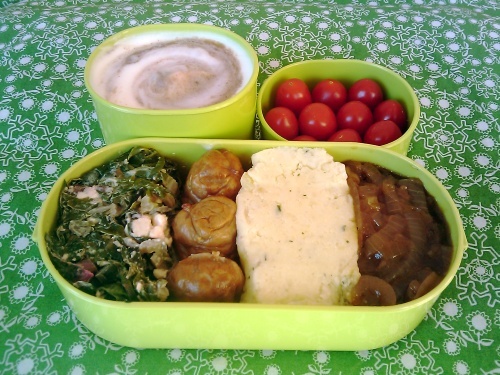 It has made many appearences in my lunch box over the last few years so I thought it was about time I shared my recipe with you. a mixed salad with lettuce, cucumber, yellow peppers and baby tomatoes. Heat oil, add onion and garlic and cook till browned. Add mince to the pot and stir to brown breaking up any clumps that form. Stir through the paprika, ground cumin, ground coriander and crushed chillies. Add chocolate and red kidney beans and cook for a further five minutes or so to heat beans and allow chocolate to meld into the chili. 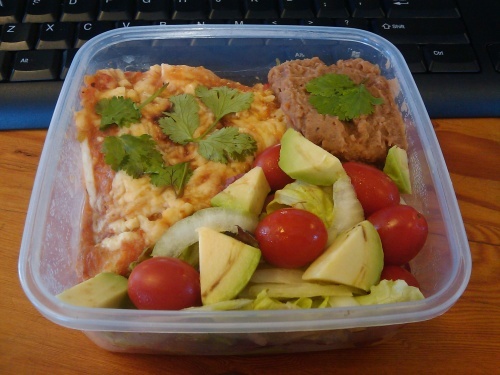 Serve on rice or tortillas accompanied with tomato salad, sliced avocado and sour cream or plain yoghurt.